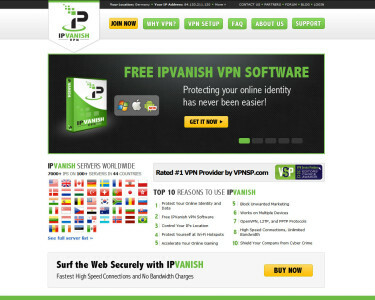 IPVanish is a virtual private network (VPN) provider that has become one of most the highly selected across the globe, due to its coverage worldwide and the success of its system, being rated as the number one pick in its arena by the site http://www.bestvpnproviders.net/ in the 2014 Editor’s Choice Awards. The company offers three packages based on a time range, including one month, three months, and one full year. Currently IPVanish is offering special reduction on each, the one month package has moved from $11.99 to ten dollars, while the three month package saves the potential customer twenty five percent, dropping from $35.97 to $26.99. Not to be left out, the full year package has been decreased by forty six percent, from $143.88 to $77.99. Click here to get a FREE IPVanish Trial. Apart from the adequately priced packages, which includes a money back guarantee, the customer is able to select the type of protocols that interest them, including, L2TP, PPTP and the OpenVPN which all function on a high speed connection with no additional bandwidth charges. Through this company, the client is not only able to gain control of the data transmitted online, but protect themselves behind more than seven thousand IP addresses, ensuring safe internet surfing. IPVanish also offers technical support 24 hours, every day of the week. The company is not only supported in United States and countries throughout Europe but also can be accessed in Japan, and South and Central American countries such as Mexico, and Brazil, just to name a few. The options that IPVanish gives to its users, as far as customizing the way one wishes the program to function sets it apart, as selection is easily done, and easiliy executed, offering not only the server and its location but also the speed that accompanies it. There is no doubt that internet browsing presents undeniable risks, but IPVanish has found an efficient way to manage safety online.